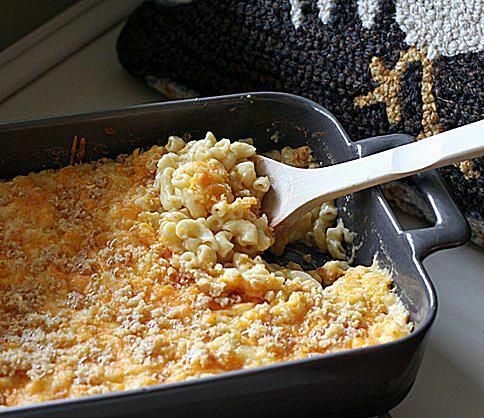 This is a favorite macaroni and cheese recipe shared by a forum member. This dish makes a great side dish or main dish casserole. Cook the macaroni until al dente, drain, and place in a casserole. Mix together the milk, salt, flour, and fat and cook in a double boiler until thick. Add the salt, pepper, dry mustard, and grated cheese, mix well, and heat stirring until the cheese is melted and well blended in. Pour over the macaroni in the casserole, sprinkle the top with dried bread crumbs, and bake for 15 minutes. The secret, according to both children who still make this dish regularly, is the mustard. I can report that they both use a pretty generous teaspoon. For cheese, one uses the sharpest cheddar she can find (as do we) and the other a mild cheddar. This was -- in my family -- a standard Wednesday night supper. When we had children it was frequent (kids LOVE macaroni and cheese), and after one experience with a purchased product they rebelled, Gramma Cameron's only. And it was so easy that they enjoyed making it themselves. The 'lumpy' problem with flour was obviated by the method of adding the flour and fat to the milk and mixing it smooth before putting on the heat. Also from use and children's insistence, always whole milk, never the 2% form.